Yetis come in many breeds here in Colorado. Some are oak aged, some are Belgianized, some are chocolaty, some with espresso, and some just all by themselves. But regardless of the breed, they are all dark as night. One of Great Divide Brewing Company's great legacies has been it's Yeti Imperial Stouts. 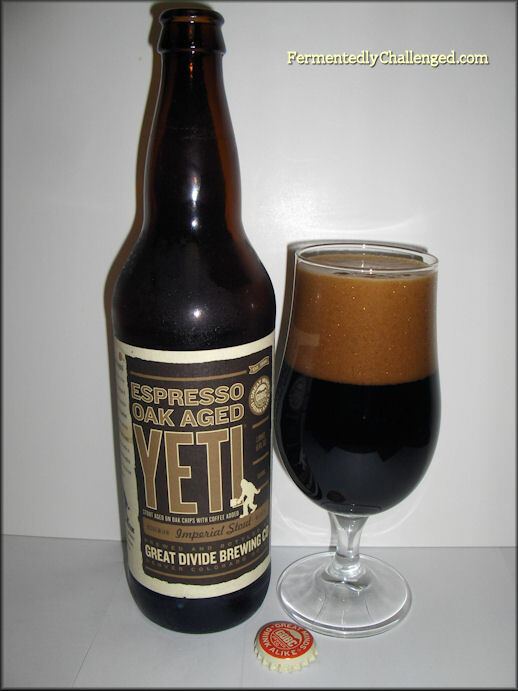 This review is of one of its special blends - the Great Divide Espresso Oak Aged Yeti Imperial Stout - made with espresso from Denver's Pablo's Coffee. Yetis come either in 22oz bomber bottles or on draft and I tend to have access just to the bottles up here in Northern Colorado. 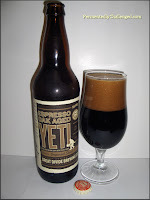 Espresso Oak Aged Yeti weighs in at 9.5% ABV so you know it deserves some respect from the get go. Stouts and imperial stouts made with coffee tend to be called breakfast stouts. In fact, Great Divide even suggests pairing this brew with some breakfast entrees such as breakfast burritos or Eggs Benedict. I tend to like to age my imperial stouts and this one was bottled on December 19th, 2011 - so this bottle had aged for about 10 months prior to opening. I have been well versed in other imperial stouts and coffee beers. How would this one stack up to the rest? Appearance: Espresso Yeti pours as black as beer can get. I mean dark! The head alone was a dark brown frothy wonder that rose quickly and stuck around for a while. The glass was covered with a thick sticky lacing. Don't even think about trying to see anything through this beer, even along the edges. Aroma: Ahh, there's something about a good roasted coffee aroma mixed in with traces of vanilla from the oak and a sweet roasted malt that just makes me melt. This beer has all of the qualities I look for in an imperial stout, but with the extra added bonus of coffee and vanilla. It made for one highly tempting brew. This beer needed no agitation in the glass to bring out the aroma. In fact, if you do swirl it, you may not appreciate the aroma as much. Taste: Thick is a word that comes to mind. This beer had the huge body (probably why they named it Yeti). The brew covered everything with a rich dark roasted tasted. Bitter like coffee with a hint of that vanilla, some chocolate notes and a touch of sweetness as well. It was like a breakfast wake up with a smack of the hard stuff. I could tell this was a high ABV brew, yet it was bitter and smooth at the same time. I really like how the oak added some extra flavor in this beer. Subtle vanilla tones and an earthy character. The coffee was blended in well and wasn't too strong. I could pick up on a taste like molasses in this beer also, but am not sure if that is actually an ingredient in this beer. Overall: Slow sipping coffee stout goodness is about the best way I can sum this beer up. There's just something to be said about a good coffee beer. Throw it in an oak barrel for a while and it become something much more. I really wonder if this beer would mellow in its bitterness even more with another year or two. Guess I'll have to buy another bottle and tuck it away to find out. Cellar this beer if you can, then savor it with a friend or two. Wow. This beer is all that and one of my favorite Yetis from Great Divide. I love this in small quantities due to its powerful flavor. Yum. I'll have to tell you later on if this brew has enough coffee in it to keep me awake at night. I imagine it could. - Great Divide Belgian Style Yeti Imperial Stout review. - Great Divide Chocolate Oak Aged Yeti Imperial Stout review.